With mindfulness becoming so mainstream nowadays there are so many really excellent resources available, mindful practitioners, Apps, YouTube, online courses. Cultivating a sustainable mindfulness practice requires great care, intention and discipline. It’s very much like growing a garden that needs constant tending to in order for it to flourish. Our thoughts can be like the peskiest of weeds or the most spectacular flowers. With mindfulness practice we start shining a light on our inner garden using attention and awareness to be fully in the present moment naturally, shifting and releasing old habit patterns of thought and behavior that hold us back from being our best and most authentic selves. With daily practice we start to carve out a new way of being in this world. If you’ve decided to commit to a regular mindfulness practice its important to be clear on ‘why’ you’re doing it and also to do your best to cultivate an attitude of patience, kindness and curiosity, while practicing. With mindfulness becoming so mainstream nowadays there are so many really excellent resources available for practitioners. There are many apps, YouTube videos, online courses, as well as mindfulness coaches. Wherever you are at with your practice these resources can be of incredible value to helping you with your practice. Should I use mindfulness apps or hire a mindfulness coach? Apps can be of great help anywhere along your meditation path, but especially when you are just starting your journey to a committed mindfulness practice. When you first sit in meditation and come into stillness, the mind has a strong tendency to resist. In fact it can be down right uncomfortable when you first experience more intimately the busyness of the mind. So having a voice, through an app; guide you through the meditation can be quite helpful. Also with a number of the apps like Headspace, Insight timer and Calm, there is a wide selection of mindfulness meditation styles to try, various lengths of meditations, tutorials, education…etc. With this kind of guidance through these apps they can be a great support piece in your mindfulness practice. A mindfulness coach can truly be an integral part in the cultivation and sustainability of your mindfulness practice for a number of reasons. This busy mind of ours can be incredibly clever. As previously mentioned, sitting in stillness initially isn’t very comfortable for our minds. We can be very quick to come up with every excuse in the book not to sit and practice. Having someone to guide you through this process and offer support and structure, can be invaluable in the practice. With a coach, you can’t say you’re too busy today, or that you can’t do it. Through the help of someone who already has experience and an established practice, you can quiet the voices that create resistance in your mind and simply ‘do it’. Mindfulness apps are wonderful and a great tool to utilize along the path but having a supportive connection with a mindfulness coach gives you a much greater chance of sustaining your practice and making it a lifelong new way of being. 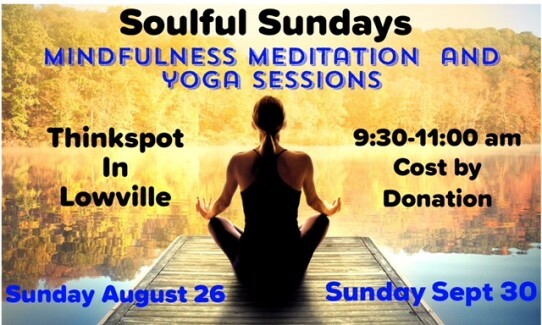 Join us at the end of each month at Think Spot in Lowville for Soulful Sunday with Greg Klym. From 9:30 am to 11:00 am, We’ll practice yoga in a wonderful green space and sit by the fire for mindfulness meditation. Connect with Greg at greg@gregklymcoaching.com to set up your initial consult! The next dates are on August 26th and Sept 30th, so bring your yoga mat and your presence!